AXON has a 13-megapixel camera on the back and a secondary 2-megapixel camera that sits above it to help capture 3D depth for a refocusable photo. To get a better idea of the story behind the challenging work, Mobile World talked with two engineers from ZTE’s camera lab. Why did you decide to introduce a dual lens camera into AXON? How will the smartphone camera develop in the future? Dual-lens camera technology is prospective. Photos taken by a single-lens camera are some kind of object simulation, while photos taken by a dual lens camera are more vivid because dual lens cameras capture more information. ...In terms of intelligence, we improve image stabilization and low-light photography through better algorithms and relevant technologies on AXON. Are there any differences between ZTE’s dual-lens camera and other similar products? The distance between the two lenses of AXON is wider. AXON outperforms other dual-lens smartphones in the large aperture effect, depth calculation accuracy, and distance of objects from the camera. What are the trends for future smartphone cameras? Both single-lens cameras and dual-lens cameras will coexist. Single-lens cameras will dominate in the near future, and dual lens cameras will continue to improve. What are the tough nuts to crack in introducing the dual-lens camera to AXON? How did you overcome these difficulties? ...No smartphone project at ZTE has required so many human resources on the R&D of the camera app, and no camera app has received so much attention. Which camera feature do you like most? Can you explain more about how the refocus feature works? The dual-lens camera captures and adds depth data to each object in the image. These data allows you to refocus a picture and add a blur effect to select parts of the image. Front high pixel camera module, dual camera module, OIS rate mounted on the side as expected the speedy pace..."
Nikkei reports that Sony announces a structural reform and personnel changes that will take effect on Jan 1, 2015 (probably a typo, should be 2016). Sony Device Solution Business Group will be split in 3 organizations: "Automotive Division," "Module Division" and "Product Development Division." The reorg will strengthen Sony image sensor business. Sony can better address the fast growing automotive image sensor market where On Semi currently has the largest share. By offering modules rather than image sensors, it becomes possible to better support customers that do not have capabilities to use tune and adapt image quality. 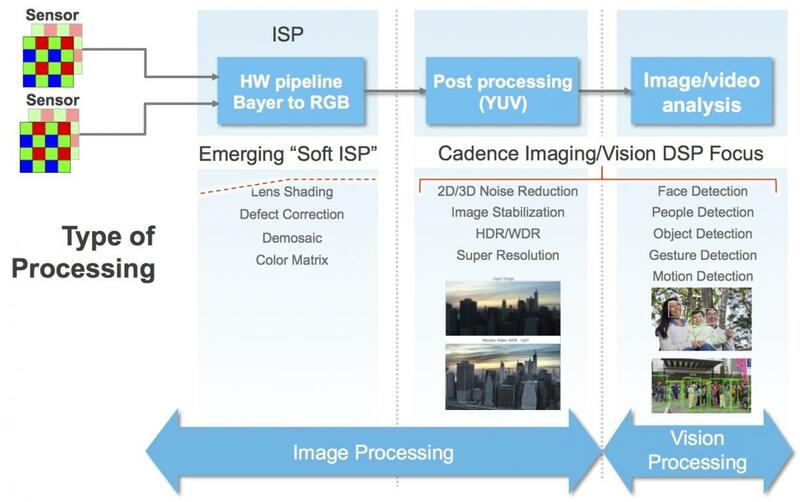 The other reasons for shifting focus from image sensors to camera modules might be an attempt to replicate Sharp camera module success, and an intention to capture a larger chunk of the imaging foodchain. Update: Upon a closer look, VG6640 image sensor and STV0991 image processor appear to be the new, previously unannounced devices. SystemPlus publishes reverse engineering of Fujitsu Iris Authentication Module IR Camera Module & IR LED. The module has been extracted from Fujitsu Arrows NX F-04G smartphone that uses iris scan as the next biometric login technology. Compared to fingerprint sensors, Fujitsu claims that the solution features a faster, safer and more secure authentication. It is also a cost effective solution due to the reuse of standard CIS and LED components. OSRAM is said to be the IR LED manufacturer and has designed this 810nm LED exclusively for this iris scan application (this sounds somewhat contradictory to the re-use statement). 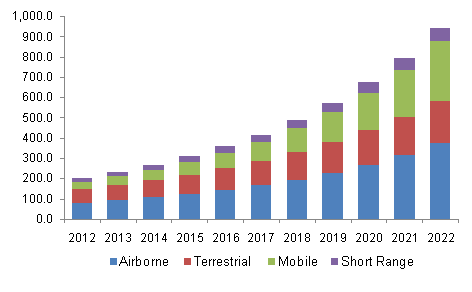 GlobeNewsWire: Grand View Research estimates the global LiDAR market size at over $260M in 2014. The market is expected to grow to $944.3M by 2022 driven by improved automated processing ability in data processing and image resolution capabilities. "The laminated image sensor is made by combining (1) an image sensor equipped with an RGB color filter for visible light (top layer) and (2) a near-infrared image sensor (bottom layer). Each layer functions as an independent sensor and independently outputs video signals. The visible-light image sensor is a backside-illuminated type, and its light-receiving layer (made of semiconductor) is as thin as 3μm. Each pixel measures 3.8 x 3.8μm, and the number of pixels is 4,224 x 240." "We are working to develop such a spot thermometer within Heimann Sensor. Many players in the mobile phone business are looking at these devices but we think that two more years of development are needed in order to get them working. First, single pixel sensors will be used and then arrays will be introduced into the market. The remaining issues are significant. For example, getting a compact device, within a thin ‘z budget’, is very challenging and needs further development at device and packaging level. In the same way, heat shock resistance is a challenge at the moment. The applications of remote temperature sensing are just huge. Fever measurement, checking outdoor temperatures from your mobile phone, water temperature measurement for a baby’s bath or bottle - the list is endless. Most require 1 or 2°C accuracy, which is already available, while body temperature needs further development to reach 0.2°C accuracy. We expect to see the first mobile phone with this feature around Christmas 2017." The base P5 core is said to be less than 2 mm2 in size in a 16nm process, with minor additional area increments for the optional FPU and cache and instruction memories. 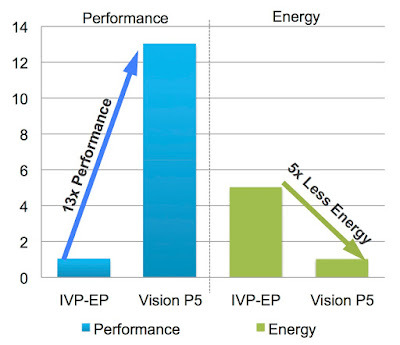 Lead customers have been evaluating and designing in Vision P5 for several months, and the core is now available for general licensing. "Caeleste was created in December 2006, by a few people around the former CTO of Fillfactory/Cypress. After an organic growth start, Caeleste is now 22 persons large and fast growing with a CAGR of 30-50%. It is specialized in the design and supply of custom specific CMOS Image Sensors (CIS). Caeleste is still 100% owned by its founders. ...In fact, Caeleste has almost the largest CIS design team in Europe, exclusively devoted to customer specific CMOS image sensors." Caeleste has the world record in low noise imaging: We have proven a noise limit of 0.34 e-rms; this implies that under low flux conditions (e.g. in astronomy) each and every photon can be counted and that the background is completely black, provided that the dark current is low enough. Caeleste has also designed a dual color X-ray imager, which allows a much better discrimination and diagnosis of cancerous tissue than the conventional grey scale images. Caeleste has also its own patents for 3D imaging, based on Time of Flight (ToF) operation. This structure allows the almost noise free accumulation of multiple laser pulses to enable accurate distance measurements at long distance or with weak laser sources. 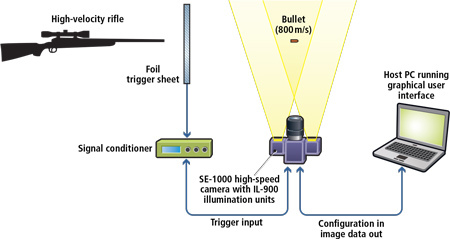 "CMOS Image Sensors (CIS). Approximately 15% of sales, ex-Panasonic. Tower offers advanced CMOS image sensor technology for use in the automotive, industrial, medical, consumer, and high-end photography markets. Tower estimates the silicon portion of the CMOS image sensor market to be a ~$10B TAM, with ~$3B potentially being served via foundry offerings. Today, roughly two-thirds of this market serves the cellular/smartphone camera market; however, the migration to image-based communication across the automotive, industrial, security and IoT markets is expanding the applications for Tower's CIS offerings. Tower is tracking toward 35% Y/Y growth in this segment in 2015, outpacing the industry's 9% compounded growth rate, as the company has gained traction in areas previously not served by specialty foundries. Tower has IP related to highly customized pixels, which lend the technology to a wide variety of applications. We see opportunities in automotive, security/surveillance, medical imaging, and 3D gesture control driving sustainable growth in this segment long term." 2014 to 2019 to approximately $13.3B, from $10.4B in 2014"
SeekingAlpha reports that Tesla comes to Mobileye's rescue. "We think it is extremely unlikely that a single person or even a small company that lacks extensive engineering validation capability will be able to produce an autonomous driving system that can be deployed to production vehicles," says Tesla. "[Such a system] may work as a limited demo on a known stretch of road -- Tesla had such a system two years ago -- but then requires enormous resources to debug over millions of miles of widely differing roads. This is the true problem of autonomy: getting a machine learning system to be 99% correct is relatively easy, but getting it to be 99.9999% correct, which is where it ultimately needs to be, is vastly more difficult. Going forward, we will continue to use the most advanced component technologies, such as Mobileye’s vision chip, in our vehicles. Their part is the best in the world at what it does and that is why we use it." Infineon and pmd unveil their latest 3D image sensor chip of the REAL3 family. Compared to the previous version, the optical sensitivity as well as the power consumption of the new 3D sensors has been improved and the built-in electronics take up little space. The chips make it possible for cell phones to operate mini-camera systems that can measure 3D depth data. 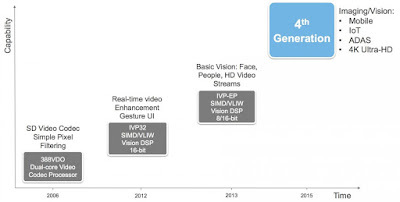 The optical pixel sensitivity of the new 3D image sensors is now double that of the previous version. This means that their measurement quality is just as good, while at the same time working with only half of the emitted light output and the camera’s system power consumption is almost halved. The improved optical pixel sensitivity is the result of applying one microlens to each of the pixels of the 3D image sensor chip. The new 3D image sensor chips were specifically designed for mobile devices, where most applications only need a resolution of 38,000 pixels. The previous 100,000-pixel matrix was accordingly scaled down, and other functional blocks, such as the analog/digital converter for the chip area and performance range were optimized. Thus, the system cost is lower: the sensor chip area is almost halved, and, because of the lower resolution, smaller and less expensive optical lenses can be used. The three new REAL3 3D image sensors differ in their resolutions: the IRS1125C works with 352 x 288 pixels, the IRS1645C with 224 x 172 pixels and the IRS1615C with 160 x 120 pixels. In this respect, the IRS1645C and IRS1615C are produced on half the chip area of the IRS1125C. Google’s “Project Tango” using Infineon's IRS1645C 3D image sensor chip. The complete 3D camera for Google “Tango” – consisting of IRS1645C and an active infrared laser illumination – is housed in an area of approximately 10 mm x 20 mm. With a range up to 4 meters (13 feet), a measuring accuracy of 1% of the distance and a frame rate of 5 fps, the 3D camera subsystem consumes less than 300 mW in active mode. The IRS1125C will be available in volume in Q1 2016. The start of production for the smaller IRS1645C and IRS1615C is planned for Q2 2016. All three types are exclusively delivered as a bare die to allow maximum design flexibility while minimizing system costs. IS&T Electronic Imaging (EI) Symposium publishes a number of interesting presentations, such as "A novel optical design for light field acquisition using camera array:"
"3D UHDTV contents production with 2/3 inch sensor cameras:"
"The Sony 12 megapixel CMOS image sensor is fabricated using a 4 metal (Cu), 90 nm CMOS image sensor process. The backside illuminated die is wafer bonded to an underling control ASIC using through silicon vias (TSVs) to provide die-to-die interconnections. The image sensor features a 1.22 µm large pixel with RGB color filters and a single layer of microlenses. Four pixels share a common readout circuit comprising four transfer gates, a reset gate, select gate and source follower in a 1.75T architecture." 2017 International Image Sensor Workshop (IISW) announces its time and location. The workshop is to be held on May 30th – June 2nd, 2017 in Hiroshima, Japan. The Grand Prince Hotel Hiroshima is located on a small island in south Hiroshima with a nice archipelago view from the hotel. Miyajima and the downtown Hiroshima, which are UNESCO world heritages, are within the reach and are good excursion candidates. JBHNews quotes a rumor that Microsoft Lumia 1050 smartphone, to be released in January or February 2016, would feature 50MP camera having a variable aperture, a zoom lens, an OIS and a laser AF. "Overall, Lumia 1050 would be a defining phone in the history of Microsoft." Polarization affects the way in which light bounces off of physical objects. Light within a certain range of polarizations is more likely to be reflected. So the polarization of reflected light carries information about the geometry of the objects it has struck. Microsoft Kinect is used for a coarse depth estimation, while polarization helps to interpolate and improve its depth accuracy. Thanks to AG for the link! WSJ, Forbes, The Verge: Augmented-reality startup Magic Leap could raise up to $827 million in a new funding round. This would bring Magic Leap’s total funding to about $1.4 billion. If Magic Leap raises the full amount, it could be valued at about $3.7 billion, according to venture-capital data firm VC Experts. The previous investments came from Google, Qualcomm Ventures, KKR, Vulcan Capital, KPCB, Andreesen Horowtiz, Obvious Ventures and others. “We’re fundamentally a new kind of lightfield chip to enable new experiences,” said Magic Leap founder and CEO Rony Abovitz at a conference in June. “There’s no off-the-shelf stuff used. That’s the reason for the amount of capital we’ve raised — to go to the moon.” Abovitz also released Magic Leap’s SDK and said the company was building 260,000 sq. ft. manufacturing facility in Florida to develop components for the device. Pixpolar was awarded European Commission’s Seal of Excellence. Certificate delivered by the European Commission,as the institution managing Horizon 2020, the EU Framework Program for Research and Innovation 2014-2020. Following evaluation by an international panel of independent experts Pixpolar Oy was successful as an innovative project proposal. A year ago, Pixpolar Oy received the funding from the first round of Horizon 2020 Small and Medium-sized Enterprises (SME) Instrument funding from EU for Phase 1 projects. In this round, the instrument received in total 2602 eligible project proposals, out of which 6% received funding. The toughest competition was within the Open Disruptive Innovation (Information and Communication Technologies) topic, where 3% of 886 eligible proposals received the funding. Pixpolar Oy was the only successful applicant from Finland under the Open Disruptive Innovation topic. Also a year ago, Pixpolar Oy has received a support from TEKES (the Finnish Funding Agency for Technology and Innovation) for a demonstrator project. Vrije Universiteit Brussel awards its first Certificate of Appreciation to Optrima/SoftKinetic, a 3D Sensor company and a very successful VUB spin-off. The award is a token of recognition of the contribution, quality work, and dedication in promoting and valorising VUB's technological excellence around the globe. In October 2015, Sony announced the acquisition of SoftKinetic Systems. SoftKinetic originated from a merger of VUB spin-off Optrima and SoftKinetic in 2011. Prof. Maarten Kuijk (ETRO), who founded Optrima with four of his PhD students, stood at the origin of SoftKinetic's groundbreaking 3D technology. ams announces the completion of the transaction to acquire CMOSIS. Based on MOU on October 28, 2015, Sony and Toshiba have signed definitive agreements to transfer to Sony and to Sony Semiconductor Corporation ("SCK"), a wholly-owned subsidiary of Sony, Toshiba fab facilities, equipment and related assets in its Oita Operations facility, as well as other related equipment and assets owned by Toshiba. Toshiba will transfer facilities, equipment and related assets of Toshiba's 300mm wafer production line, mainly located at its Oita Operations facility. The purchase price of the Transfer is 19 billion yen. Sony and Toshiba aim to complete the Transfer within the fiscal year ending March 31, 2016. Following the Transfer, Sony and SCK plan to operate the semiconductor fabrication facilities as fabrication facilities of SCK, primarily for manufacturing CMOS image sensors. Sony is to offer the employees of Toshiba and its affiliates employed at the fabrication facilities, as well as certain employees involved in areas such as CMOS sensor engineering and design (approximately 1,100 employees in total), employment within the Sony Group. At the time of construction of Oita fab in 2004, Toshiba said that it is to "be the first semiconductor facility in the world to deploy 65-nanometer process and design technologies. ...A 200 billion yen investment program from FY2003 to FY2007, will bring production capacity to 12,500 wafers a month. This could be further expanded if necessary, up to a capacity of 17,500 wafers a month, with further investment." PRNewswire: OmniVision reports the results for its fiscal quarter that ended on October 31, 2015. Revenues were $343.1M, as compared to $329.9M in the previous quarter, and $394.0M ia year ago. GAAP net income was $13.9M, as compared to $18.2M in the previous quarter, and $28.0M a year ago. GAAP gross margin was 21.9%, as compared to 22.6% for the previous quarter and 22.0% a year ago. The decrease in gross margin was attributable to broad-based price erosions, particularly in the mobile phone market. The Company ended the period with cash, cash equivalents and short-term investments totaling $613.5M, an increase of $19.7M from the previous quarter. "We are very pleased with our second quarter results. We have exceeded our own expectations, despite demand uncertainties in our various target markets," said Shaw Hong, CEO of OmniVision. "Regardless of these short-term uncertainties, we will continue to invest in the future of our business, and ultimately, return to our long-term growth trajectory." Based on current trends, the Company expects revenues for the next quarter in the range of $310M to $340M.